-Hoof trimming day last week went smoothly. It’s fun to watch the horses watch the other horses get their pedicures. Most everyone was easy to catch, too. Falcon Scott took a run around his paddock, just because he could. Creator did the same but he doesn’t really have the inclination to work too hard to get away, so after a few strides at a canter he gave up and stood like a gentleman. -Pops and Ring have a well-earned reputation for being hard to catch on trim day. As a result, any number of people were lined up at the fence waiting for the show. And you guessed it: contrarians that they are, Pops ran toward us to be easily caught and Ring stood quietly next to him waiting for his halter. All I could think was, “Really? Really?” Once again, the hoodlums prove they are smarter than the people. (I might like to add to Kent: ha! and a wink). -The mares-Hidden Lake, Personalized, Miss Hooligan-wandered over to the fence to watch the boys next door get trimmed, then stood perfectly while their own feet were done. Sensible girls, all of them. -Tinner’s Way, not necessarily known for standing quietly, ever, proved that his rep depends on his mood. He barely needed to be held onto. -Angie Dickinson, movie star, TV’s Police Woman, Old Friends supporter and all around nice person, spent some time at the farm last week. Had the great pleasure of meeting her, and also was honored that she joined several of us for some personal conversation. It was a memorable experience. – Noor is on his way to Old Friends, to be re-interred in what will become our Hall-of-Fame cemetary. 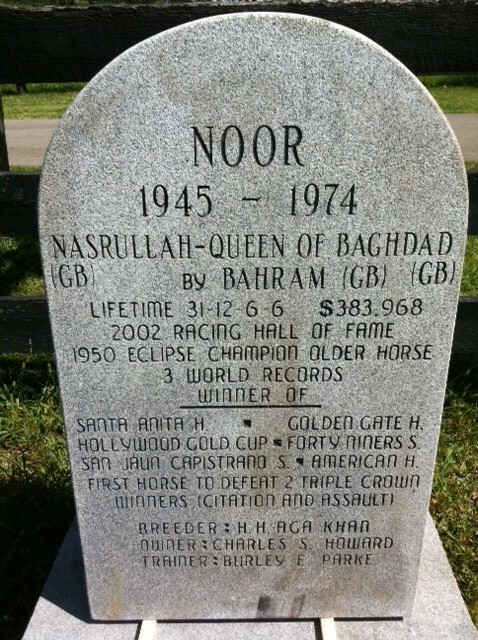 Noor beat both Citation and Assault, both Triple Crown winners, and was owned by Seabiscuit’s owner Charles Howard. Some history there, for sure. Noor’s ceremony is this coming Wednesday morning (8/31) and is open to the public. Call the office for more info. After a couple weeks of photo blogs, it’s nice to be back writing. I can tell summer is winding down and the school year is beginning, because it was a relatively quiet day with only a few people on each tour. The weather was nice; despite some rain in other parts of the state we stayed dry until this evening, with sunshine and a nice breeze most of the day. I have mixed feelings about having fewer people on tours. Of course, I love to introduce as many people as I can to our horses. On the other hand, smaller tours mean more time with each horse, and a chance to really see individual personalities shine. We can take the time for a really good back scratching for Kiri, or to let Sunshine tell us he is the greatest horse ever. We can chase some flies for Gulch and give Commentator’s face a good rubbing. And it’s ok if Ogygian detours for a drink of water before he ambles over, while we lean on the fence and discuss everyone’s questions in depth. I really enjoy getting to know the new stallions, too. 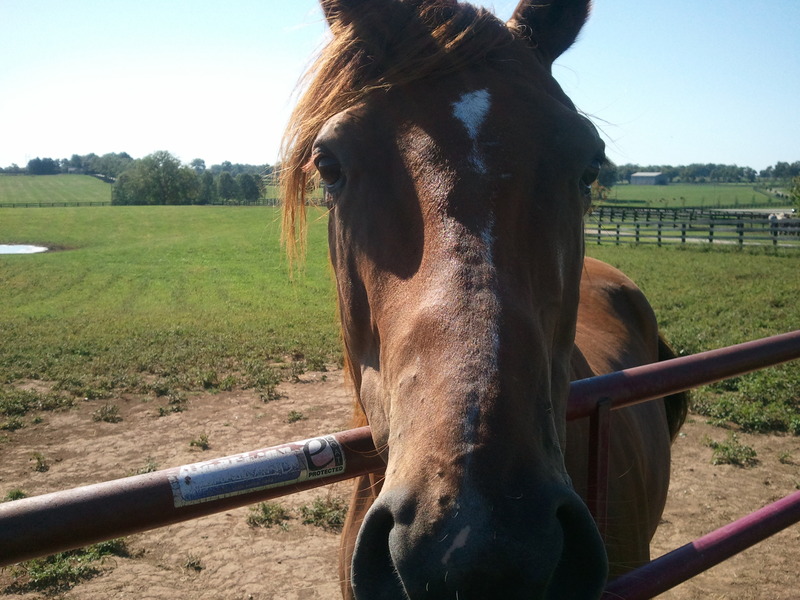 As our most recent addition, Prized has figured out the routine and he happily meets us at his gate for treats. Prized is in the paddock previously belonging to Awad, and I found it interesting to note that Pops and Ring are working on irritating Prized much like they did Waddy. 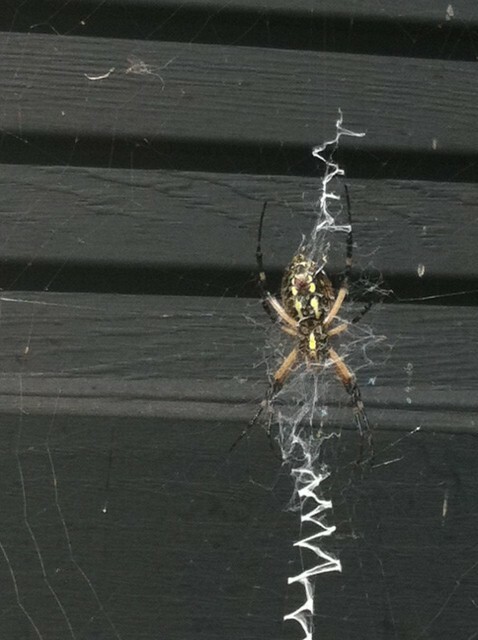 Pops and Ring stand across the fence and eyeball Prized, who paws the dirt and tosses his head and grumbles. I think it’s kind of like having small kids in the backseat of the car on a road trip: “Mom, he’s looking at me funny. Tell him to stop!” But then I’ve always thought Pops and Ring find many things with which to amuse themselves throughout their day! Along with her parents, the other child on the farm today was visiting our farm manager Janet. We stopped our tour to watch as this teeny, tiny girl dressed in pink fed Marquetry carrots. She barely came up to his knee. Kent held the lead and Marq dipped his head to little girl level, taking nearly her entire hand gently in his lips to get those carrots. The whole thing was pretty adorable. Old Friends has another new horse, as well. He is a great addition to the farm—no oats or hay needed and he takes up about 3 feet of space. Plus, he is very fancy. You’re probably wondering, right? Well, I noticed today there is full-sized carousel horse in residence inside our gazebo. No idea how he got here, what his racing stats look like, who trained him or what his breeding is. But he sure is pretty! Besides, how can anyone resist a carousel horse? Thought I’d update everyone on a couple horses I’ve been asked about recently. Stormy Passage is doing fine. 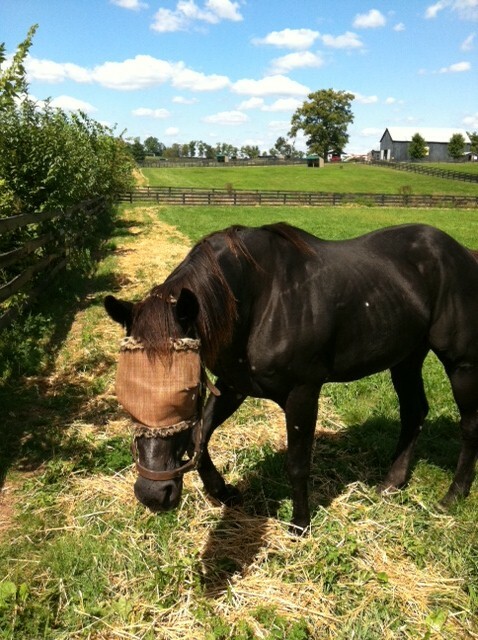 He is still in the barn, receiving treatment and work on his injured tendon. But he is shiny, happy and sometimes a little rambunctious. He’ll eventually be fine. I’m Charismatic has graduated from total stall rest to spending a couple hours each morning outside in a small paddock. That’s about all the time his over-used ankles can take before he heads back into his stall to rest, but it’s a big improvement over all day inside. He also looks shiny and content. 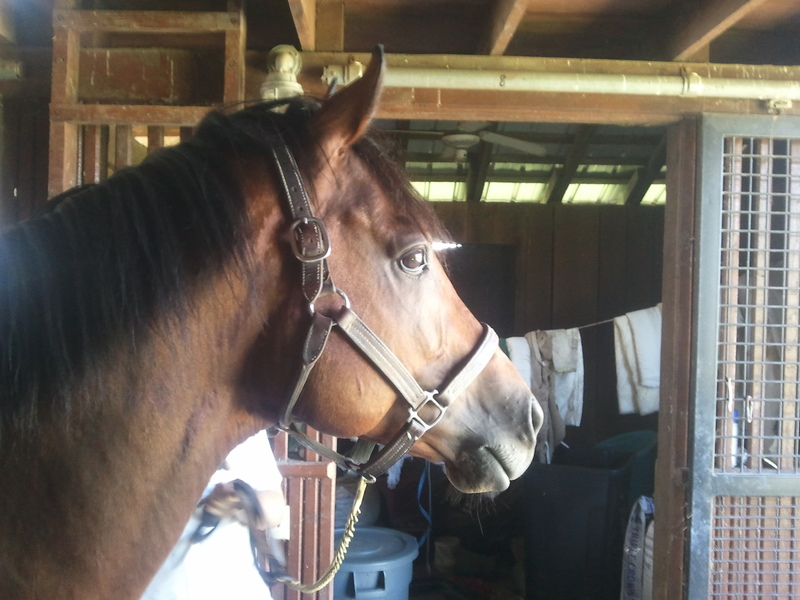 Canadian champ Benburb, who as you all know has melanoma, is still the fattest, happiest horse south of Niagara Falls. He goes out at night and spends his days inside the barn. No horse, including peppermint-hound Tator, loves his mints more than Bennie. He is a sweetheart. Ball Four and Cherono are having a blast in their big field with Kudos and Bonapaw. That is a good foursome. And one of my other favorites, seven-year-old Gasconade, has grown and filled out into a gorgeous bay stallion. There are not many prettier horses than he, although I am somewhat biased I suppose. That’s about all from here for this Sunday. Tomorrow is farrier-school hoof trimming day at the farm, also known as It Takes Six People To Catch Pops And Ring Day. There’s some Funniest Home Video potential there! We hope you can visit us soon, but in the meantime, thanks for spending this Sunday with Old Friends. Took the week off from tours to visit with family, and we spent some time wandering around Old Friends on a gorgeous summer day. Not too hot, not humid, with a warm breeze and puffy white clouds, it was a picture perfect day. By the way, it’s become apparent to me that Afternoon Deelites is a camera hog, and I apologize for that. He just never takes a bad photo! All photos courtesy Liz Ditonto, except where noted taken by Nick Newman. On Wednesday, my friend Carolyn from Pittsburgh and her co-worker Jeff were in town. We spent a hot and sultry evening enjoying the peace and quiet of Old Friends. Prized had just arrived at the farm so we were able to see his first turn-out. All photos courtesy of Carolyn Nicastro.